In the midst of this unusually snowy winter we would all welcome some vibrant color in the landscape and no plant on the Preserve provides that commodity like the claret cup cactus, Echinocereus triglochidiatus. 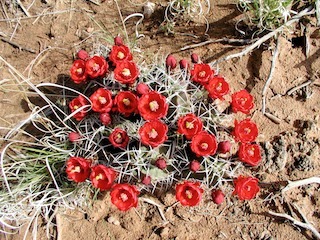 Also known as kingcup cactus and Mojave mound cactus, this beauty is usually found at the base of an accommodating juniper tree as claret cup is one of the few cacti that prefers a little shade. It can be found in many parts of New Mexico, tucked into rocky slopes, mountain woodlands, as well as lower desert areas. Members of the genus Echinocereus (from the Greek echinos meaning hedgehog or sea urchin and cereus meaning waxy) are commonly referred to as the hedgehog cacti. One of 11 New Mexico native species in this genus, the species name triglochidiatus, also derives from Greek words that mean bearing three spines. 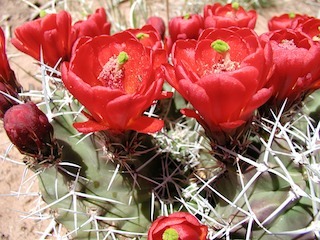 Individual stems of claret cup cacti are barrel shaped, 3-6” wide and up to one foot tall. It is a mounding cactus, sometimes found with dozens of stems in a cluster. Stems have a variable number of prominent ribs (usually seven) that bear groups of spines from distinct raised spots called areoles. A few prominent gray spines grow from each areole that are up to three inches long and quite hefty. The number of large spines/areole varies from one to six (rarely more), with groups of three, as suggested by the species epithet, being quite common on some individuals. The earliest of our local cactus species to flower, claret cup produces its brilliant scarlet flowers in May. Individual flowers typically arise just below the top of the stem and remain open for 2-3 days. Somewhat funnel- shaped, each flower is about two inches wide and three inches long. The distinctive red petals are thick and waxy with rounded ends. A tight cluster of thin-stalked pink stamens can be found in the center of the flower surrounding a substantial pistil with a green stigma to receive pollen. Claret cup flowers have a nectar chamber at the inside base of the flower and are pollinated by hummingbirds. The hummers must push their face into the mass of stamens to receive their reward, ensuring they will leave the flower with a dusting of pollen on their cheeks. 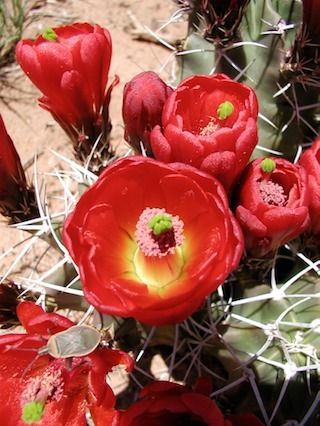 Claret cup cactus produces fleshy rounded fruits about one inch long and variable in color from green to yellow to pink. The outside of each fruit has spines that typically fall off (or may be rubbed off) and the inside consists of a juicy white edible pulp surrounding the black seeds. In addition to the fruits, Native Americans are known to have eaten the stems. After burning off the spines, claret cup stems were mashed and baked with sugar to produce sweet cakes: most fitting, in my view, for a plant with such a delicious and captivating floral display. Download this essay as a pdf here.